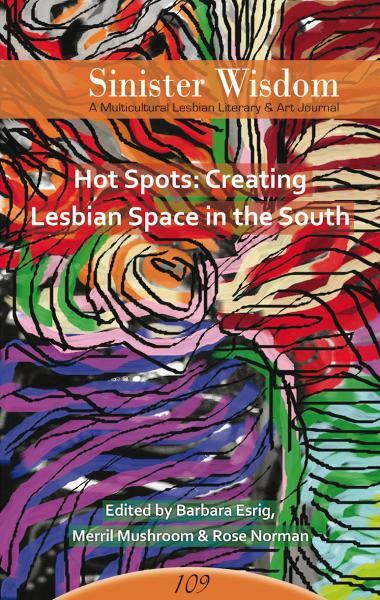 Sinister Wisdom 109: Hot Spots explores the Southern spaces where lesbians gathered and organized during the past forty years. The ways that lesbians came together during the 1970s, 1980s, and 1990s were many and varied. There was no social media, no high-speed communication. Lesbians relied on the US Post Office, telephones, and face-to-face contact. Public advertising such as newspaper ads, flyers, and leaflets had to be done carefully and discreetly. Learning about events of the past gives templates by which to formulate and support activism in the present and future. Oppression, restriction, discrimination, and disempowerment can take many forms, some more insidious than others, and activism can be especially difficult when one is a member of a despised and criminalized minority. Sometimes, the most we can do is be ourselves and live the truth in our lives. This issue is sold out. It is now available as an ebook here. Wednesday, July 25, at Babe's lesbian bar in Richmond, VA, across the street from Chop Suey bookstore, which is featuring Sinister Wisdom 109: Hot Spots as their book of the month. Join us for this festive event! Saturday, ​September 22, 2018 7 PM​ ​Hot Spots​--​What’s made Gainesville’s Lesbian Community What It Is​. At the Pride Community Center of North Central Florida,​ 3131 NW 13th St., Gainesville​. Readings and Refreshments with the local contributors to SW109, Looking back at Women Unlimited, Cultural Politics of the 1970’s, Gainesville Dykes – the song, and more!​ Local contributors include: Corky Culver, Barbara Esrig,​ Kate Ellison, Woody Blue, Rosalie Miller, Gerry Green,​ Amber Waters, Patti Carnuccio.​ Join us for an evening of celebrating lesbians in our​ home town and across the south.​ For further info contact Barbara at Bubbe1504@aol.com. Thursday, September 27, 2018 Release Party at the Regulator bookstore in Durham North Carolina. Readers include the local contributors to SW109: Sherri Zann Rosenthal (on TALF), Laurel Ferejohn (on Our Own Place), and Jaye Vaughn (on Cedar Chest); and contributors to previous issues, including Mandy Carter (who will deliver introductory remarks), Mab Segrest (on SONG), Laurie Fuchs (on Ladyslipper Music) and Lucy Harris & Babs Brown (on live women's music production), and Lynn Hicks (on Full Circle Farm). The program will also include contributors to upcoming articles on lesbian feminist publishing, including Nancy Blood (on Whole Women Press and the early Newsletter years) and Laurel Ferejohn (on the later Newsletter years).